There have been a lot of rumors and fake mockups concerning the Samsung Galaxy S III, and now a new image that has started floating around which may point to the end of all the speculation. If this one is a fake, it's one of the most detailed fakes we've ever seen. 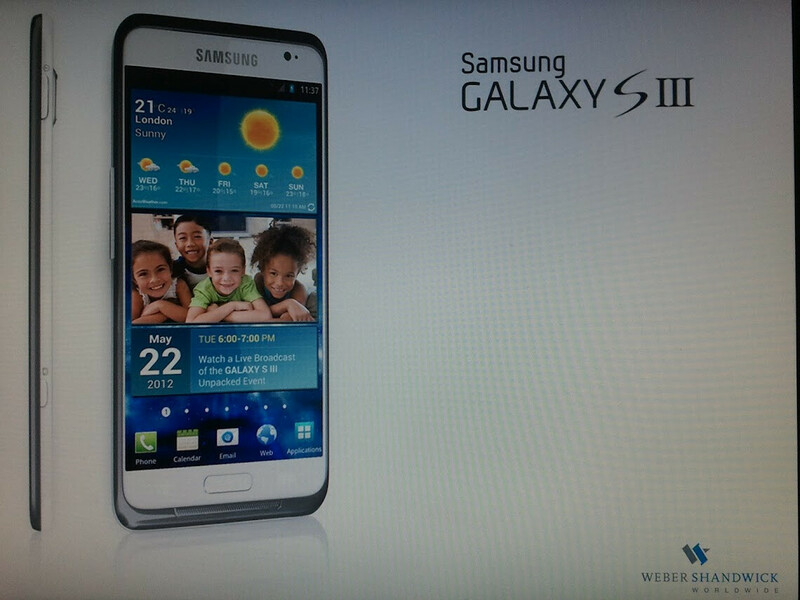 Is this the real Samsung Galaxy S III? 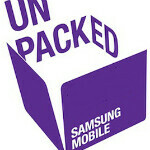 The new image looks to be a press image teasing a Samsung Unpacked event in London. If the details are to be believed, Samsung will be announcing the Samsung Galaxy S III on May 22nd at 6PM in London. A May would give a lot of lead-up to the rumored release window in July. This is all information that lines up with the last "final design" rumor image that we saw, although the phone itself looks a bit different in the new leak. The phone itself looks pretty nice, aside from completely masking Android 4.0 with TouchWiz of course. It looks very slim, with a big screen and small bezel. The home button has made a comeback, which either means Samsung thinks it has the upper hand in Apple's lawsuits, or that Apple won't mind now. The biggest difference between this image and the last one we saw is that this one looks to have capacitive buttons, not Ice Cream Sandwich on-screen function buttons, and there is a dedicated camera button on the side as well. The internals are still all rumored at this point, but no doubt it will have some impressive specs. What are the thoughts on this newest image? It certainly looks more believable than the last, but keeping capacitive buttons seems odd. What it is gonna be like? As always, way better than the small fat iPhone. Looks great. is it somewhere i can hit a agree button? looks awesome but definately fake. no front speaker grill ? I saw a higher resolution photo at Phonedog and the speaker grill is in the silver part. I'm pretty happy with the way that the design looks from this shot. Seems like they are able to get a larger screen into the phone without added bulk to the whole body by slimming down the bezel. i've been hanging onto my HTC EVO for quite a while now, but this is surely going to be a must by on my list provided that the internal specs are up to par with what we all seem to think they will be. UI won't change. Unless OEMs quit covering up the stock ICS. Well, the good news is that ICS requires that the base UI stay installed at all times, so manufacturer UI's pretty much just sit on top of that. Hopefully that means they are easier to remove and more consistent with the updates. Looks awesome, if it packs the right hardware i'm definitely going to buy it. On-screen buttons would have been much, much better than a simple home button. I do like the exterior of the phone, although I do wish the picture showed it in black/gray. All of the european versions have had the large home button, so its a design consistency. I doubt the American versions will keep it as none of them have. Also, i get irritated at the notion that apple some how has a lock on a large center button. Samsung and others have been doing that since the ol flip phone days long before the iphone was a glimmer in Jobs eye. It looks like a photoshopped version of the new Galaxy Wifi 4.2. That's exactly what it looks like. OMG it is too! 4sure that's what it is ! why is the power button so low on the phone. not practical, probably fake. Are you talking about left image or right? If you look closely at the one on the left you can see the power button icon for at the top and a camera for the bottom. On the right image that large button on the left side looks like the volume. Thats what i think anyway. But I am getting this beast for sure.